Massive Silver compartment seal, Bactrian, 3rd. mill. BC! A very rare and splendid silver Openwork Stamp Seal, Oxus civilization, Ca. 2600 to 2100 BC. 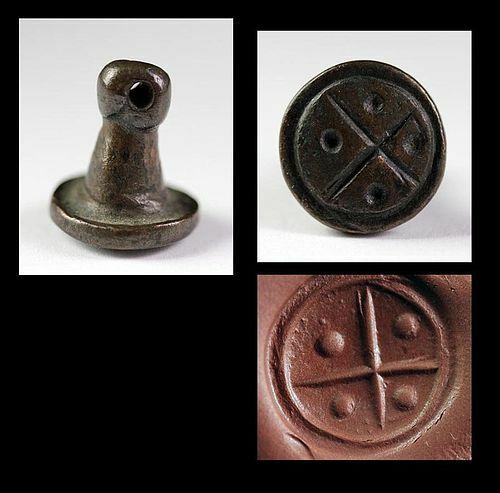 Middle Bronze Age, Western Central Asia. Even this large Compartment seals are fairly common on the market in bronze, whereas large silver seal like our seal are extremely rarely encountered! A very interesting and rare stone Macehead of faceted form, in Fossilized Limestone, Ancient Near East, ca. late 3rd.- early 2nd. millenium BC. The Macehead Octagonal (with eight edges) and vertically drilled for mounting it. In a fine and attractive fossilized stone. With a multitude of Fossils embedded in the surface. Condition: Nice some chipping to the edges in antiquity, but basically intact. 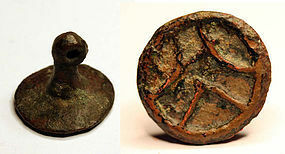 A wonderful matching set of three Mace Heads of the rare claw-shaped type, Bactria, 2nd. millenium BC. 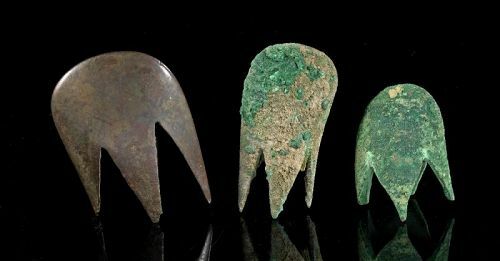 Bactrian bronze egg-shaped mace-heads with spiked sleeves or prongs, Late 2nd Millennium BC. The top of the weapons with narrow edge, the sleeves with small internal tangs for mounting them to a shaft. An exceptional condition Bactrian bronze compartmentalized seal, Late 3rd - Early 2nd Millennium BC. Simple design on the round base, tall handle. Beautyful brown patina - attractive!. Interesting design in compartements. Size: c. 20 mm. tall. Condition: Superb! 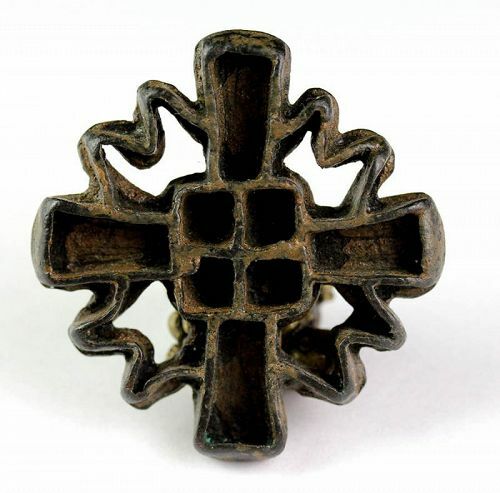 Exceptional brown patina and fine metal for the type! Interesting unidentified white stone stamp seal, Western Asia, late 3rd.-early 2nd. millenium BC. Most possible Elamite or BMAC. The seal is rectangular with a diamond cross section and engraved on both sides with a horned bull and a large bird, likely an Eagle, caugth in mid air with wings spread, looks like it's in an attacking mode. Size: 31 mm. long and 24 mm. broad. Pierced. 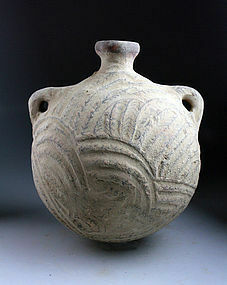 High Quality large Indus Valley / Bactria pottery bassin! 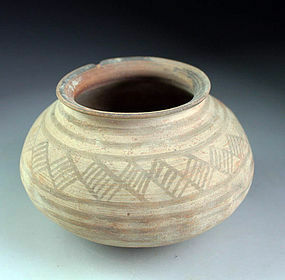 A terracotta pottery bassin / very large cup, Indus valley, likely Mehrgarh 3300-1700 BC. A well-crafted rather heavy bassin with concave sides and a footring. All decorated black on cream with the images of 4-legged animals, perhaps bulls and some stylized letters or symbols. Size: 14,3 cm. in diameter and 11,3 cm. high. Condition: CSuperb and intact! - splendid condition for the often repaired type. 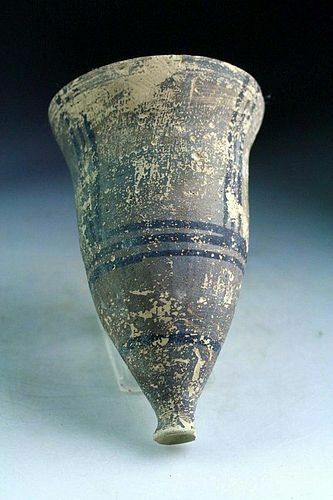 Rare and interesting pottery pilgrimsflask, Bactria/Indus, 2nd.-1st. mill BC. This flask is massive and with the frontal side carved and painted. Beautiful and rare example of an early 'pilgrims' flask. Size: Nearly 30 cm. high and 25 cm. wide. Very thick too. A rare stone bowl in black chlorite with corseted side and a mid-rim and with a carved double foot-ring. Very attractive and well made! Size: 79 mm. wide and 47 mm. high. Condition: Superb. Exceptional quality with fine surfaces. 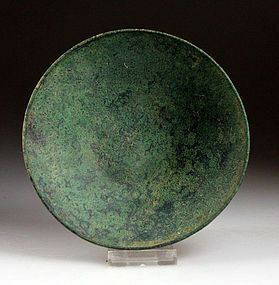 A finely hammered Bactrian / BMAC bronze bowl dating to the early 2nd. millenium BC. 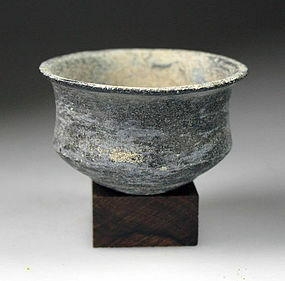 The bowl is very attractive with it's wide rim and flat base. The rim slight turned. The bowl was possibly used as a drinking bowl or for smaller meals in antiquity. Size: 138 mm wide and 37 mm high. Condition: Superb, very nice green patina, excellent metal for the type. INTERESTING CYLINDER SEAL IN STEATITE, BACTRIA-MARGIANA COMPLEX (BMAC) 3RD-2ND. MILL. BC. 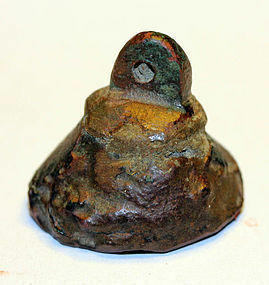 A finely preserved seal with nice smooth darker patina on the top depicting seated monkeys. Ex. Egeskov Collection and formerly in a Swedish private collection. 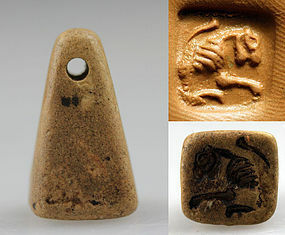 Rare Bactrian stamp stone seal of a Lion! A very rare Ancient Western Asia, likely Bactrian, stamp seal, pyramidal shape light brown stone, dating to 2nd. millenium BC. A nice seal with an engraving of a lion on the face. Pierced. Condition: Superb, intact with fine patina. Provenance: Ex. Egeskov Collection and formerly in a Swedish private collection. Rare Bactrian limestone cylinder seal! A rare cylinder seal of limestone, Bactria or Margiana, 3rd.-2nd. millemium BC. The seal finely engraved with two human figures holding spears and a lion on it's hindlegs in the archaic style. Size: c. 25 mm. high and 14 mm. thick. Condition: Choice, a few microscopic chips, but basically intact and quite sharp. Bactrian bronze seal, Late 3rd - Early 2nd Millennium BC. Simple design on the round base, tall handle. Beautyful brown patina - attractive!. Interesting crude design of an animal. Condition: Superb! Exceptional brown patina! Provenance: Johan Dæhlfeldt Estate Collection - 40 years of collecting antiquities. Bactrian bronze compartmentalized seal, Late 3rd - Early 2nd Millennium BC. Simple design on the round base, tall handle. Beautyful brown patina - attractive!. Interesting design in compartements.